Tirta Empul is located at Tampaksiring (20 km northeast from Ubud). 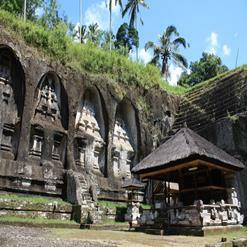 It is one of the holiest temples in Bali built around hot springs that still bubble in the central courtyard. The Balinese come here to bathe and purify themselves physically and spiritually, and during Galungan, the sacred barong masks are bathed here. The complex dates to 960, but the present buildings are largely modern reconstructions.